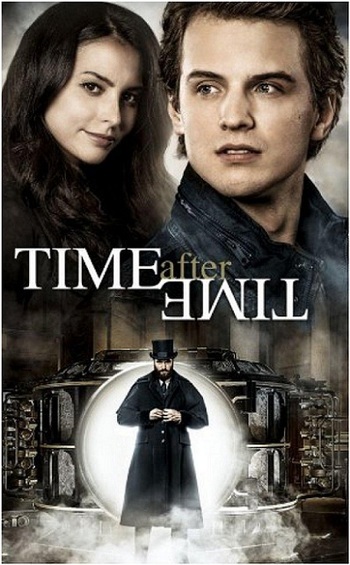 Time After Time is a 2017 television series based on the 1979 film of the same name. The show stars Freddie Stroma, Josh Bowman, Génesis Rodríguez and Nicole Ari Parker. In 1893 London, Jack the Ripper has now returned, murdering another prostitute in a dark alley. Nearby, a young H. G. Wells is holding forth in his home on the glorious utopia he foresees for the future, to his friends' skeptical amusement. When the latest guest enters, he is revealed as Jack the Ripper-or rather, Dr. John Stevenson, a respectable surgeon. Wells unveils an invention of his to the guests in his basement-a time machine. The police are on the hunt for the Ripper after the body is discovered, and Wells freely allows them to search his house. When they open Dr. Stevenson's bag, the bloody knife used in the murder is revealed. Stevenson himself is nowhere to be found however, and Wells soon learns to his horror that he has escaped into the future-March 4, 2017. The series was cancelled after five low-rated episodes. However, all 12 episodes have been broadcast in Spain and Portugal. Adaptation Expansion: A given with a movie being adapted to a TV show, but this one goes above and beyond by having Wells chase Stevenson through several time periods. Adaptational Heroism: H.G. Wells in the show is a charming man who wishes to be single after going through a divorce. In real life, H.G. Wells had multiple affairs. He left his first wife to marry his second wife Amy Robbins, who allowed him to continue to see other women. He also had children from two separate affairs. The writers seem to not want to show this historical fact, doubtless thinking a cheating womanizer would be less sympathetic. Adorkable: H.G. Wells is a charming puppy dog of a man filled with hope for humanity, even when his vision for an utopia is crushed and he finds out that his best friend is a serial killer. Artistic License  History: Stevenson expresses astonishment over how one can buy guns in 2017 New York City without questions asked. However, it was actually easier to do this in 1893 London. Licenses to buy guns weren't needed until 1903. Broken Pedestal: Wells feels this for the future rather than a person. He had expected a utopia where war, hunger and other ills had been overcome, but instead discovers those things are still very much around in 2017, to the point of him almost crying while he watches the news. Ironically as this series is related to The Time Machine, that was one of his novels where the future isn't depicted as a utopia. Jane: It's a "she" too, but keep digging your grave. Fish out of Temporal Water: H. G. Wells and Dr. John Stevenson (aka Jack the Ripper) travel from 1893 London to 2017 New York City. Stevenson adjusts better, quickly adopting contemporary clothes and technology, while Wells is initially stunned by the experience, especially that his longed-for utopia didn't happen. Hollywood Law: New York City actually has numerous restrictions on buying or possessing guns, contrary to what Dr. Stevenson says. Idiot Ball: If Jane had simply whacked John a second time she and her friend would have escaped without having to gingerly step over his body and have gotten away unscathed. She knew he was waking up - what did she expect? In Spite of a Nail: Wells disappeared from 1893 before he finished writing The Time Machine, yet he arrives in a future where the book was both written and published in his name, just as it was in real life. Though there does seem to be a case of Stable Time Loop in play. Plot Coupon: Without a special key, the time machine will return to its previous location after a couple minutes. Stevenson is constantly trying to get his hands on it to end Wells' pursuit. San Dimas Time: A more justified case than most, as Wells could program the machine to return him to the same time he left, but worries about the effect this would have on the space-time continuum (it's not like this could be safely tested, after all). Shout-Out: Stevenson refers to his struggle with Wells as a "war of the worlds" in 1918 Paris, because they arrive in many different "worlds" across time. Stable Time Loop: The series will apparently end up being one giant loop, as numerous people already know about the whole situation from trips Wells and Stevenson haven't taken yet. Wham Line: The mysterious owner of the H. G. Wells exhibit interrupts Wells' pursuit of Stevenson...and addresses him by name. You Can't Fight Fate: In "Picture Fades", John travels back to 1918 Paris to try and stop his son Henry's death. Despite his best efforts, Henry dies anyway. Wells: I'm certain you won't believe the answer to that question.